In his private life Brezhnev enjoyed a good meal, was a keen huntsman, and relished a fast ride in a car. He introduced the habit for leaders to race through the streets of Moscow at the speed of 90 miles an hour. However, as a politician, Brezhnev did not like sharp turns and preferred to apply brakes rather than accelerate too briskly. He came to power without a political program or an action plan of his own. Instead, he strove to project the image of a sober and levelheaded leader, who never took important decisions without consulting his Politburo colleagues. In practice, this approach spawned an unwieldy bureaucracy that stifled innovation and initiative and accumulated unresolved problems. Brezhnev’s basic strategy was to muddle through by balancing in the political middle and by rejecting both de-Stalinization and a full-scale return to Stalinism. 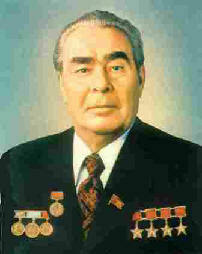 Brezhnev became general secretary because he suited almost everyone in the top leadership. His co-conspirators in the plot to oust Khrushchev regarded him as a temporary figure and would have never thought that he would be able to stay in power for as long as eighteen years. Brezhnev, however, was shrewd enough to know how to play the power game at the top political level. To understand how he was able to consolidate power, it is important to bear in mind that the CPSU had always contained within itself not one, but two parties. There was the outer party, which at that time had more than twelve million rank-and-file members; and there was the inner core comprised of several hundred thousand professional functionaries. The outer party of rank-and-file Communists had practically no say in deciding party policies and therefore the country’s destiny. Real power was concentrated in the inner party or the apparat structures. The inner party consisted of a legion of party secretaries—from the district, through regional and union republics’ levels. Brezhnev began each working day by spending two hours on the phone ringing first party secretaries in the regions and the republics and cultivating good relations with them. More importantly, Brezhnev skillfully built up his base of support within the party’s central apparatus, especially in its supreme body, the Politburo, where he was able to consolidate and enhance his authority. Brezhnev took considerable care to expand his influence by promoting his old cronies to the top party and state circles. Individuals whom he knew from the period of his work as party secretary in Moldavia and the Ukraine were persistently promoted to the top. Many of them were of very modest intellectual and cultural endowments, but had an overdeveloped taste for perks and privileges. Even a quick look at Brezhnev’s inner circle is enough to see that it was comprised of self-centered politicians with a narrow provincial outlook, who were poorly equipped to run the country when the need for change was more and more obvious.